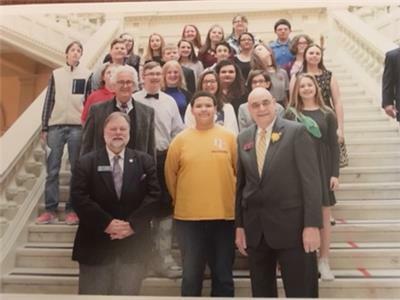 Twenty middle school students from Dade County Middle School arrived at the Capitol on Monday, March 5, accompanied by their teachers, Dr. Tom Randolph and Ms. Pamela Stone. Students brought either their personal business plans or a psychological study geared toward changing behavior. Both projects were shared by the students to representatives, senators or lobbyists as they moved around the Capitol on multiple floors. Students were instructed to approach legislators and lobbyists with the results of their classroom work, asking questions and compiling results to culminate their research.